Back in the winter of late 2005 I did something slightly foolish. One cold night, somewhat inebriated by a voluminous consumption of something French and red (not glacé cherries) I placed an eBay bid. A not inconsiderable £900, to match the starting price, was pledged towards a Jaguar. Not a classic, curvy one to lust after, but a rather badly photographed 1993 XJ40. As I clicked confirmation of my intention the only plus points in my mind were the mileage being a lowish 83,000 and the brief description saying it had a completely rust free body. Bid placed, laptop shutdown, sleep. Normally my memory is annoyingly good, recalling facts, figures and data with relative ease. Therefore I was somewhat aghast when upon checking my emails in subsequent days. 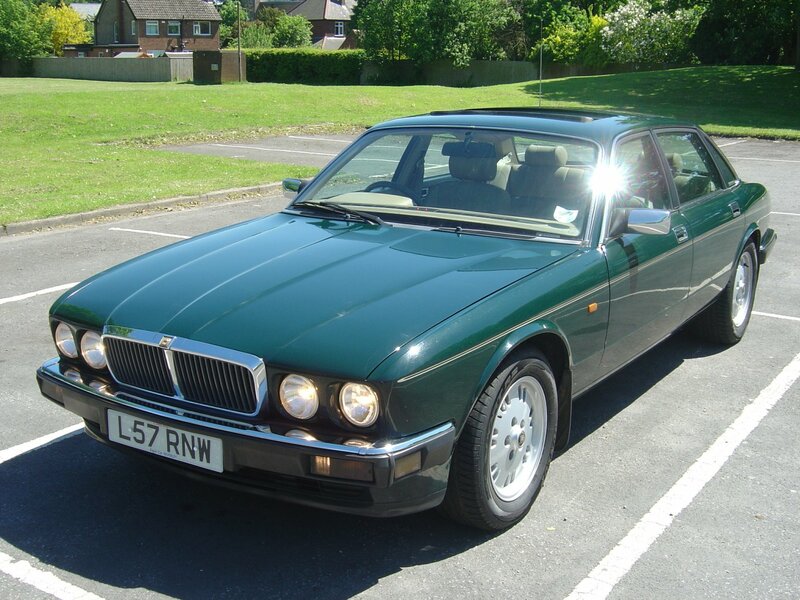 Not only did I not remember placing the bid that one email confirmed, but I had another more recent one with the subject line of “You’ve won this eBay item: 1993 ‘L’ Jaguar XJ6 Gold limited edition.” Oh. I emailed the seller who responded straight away, confirming she was pleased I’d been in touch and that she needed to point out the car wasn’t in Hull as advertised but on the East Yorkshire coast at Withernsea. I reluctantly agreed to go over the next day to collect it. Upon arrival at a rather dilapidated and ramshackle residence the following afternoon, my eyes immediately met with the sorry looking Jaguar on the driveway. The advert description said the paintwork was ‘BRG’. Evidently this stood less for the traditional British Racing Green and more for Bit Ruddy Grotty. Tentatively walking up the drive I instantly noticed the offside front bumper corner was missing. But, under the sandy dust, tree sap, leafy deposits and general muck, the bodywork did indeed look to be rust and filler free and remarkably devoid of creases and car park knocks. Peering inside revealed a more troubled story. The driver’s seat’s leather piping had worn away, a fairly common XJ40 fault and not unexpected, but the leather coverings were splitting and looked gnarled and gnawed, incongruous to the exterior condition, environmental detritus notwithstanding. Noticing the car was unlocked – after all, why keep it locked when it’s in the secure confines of an open driveway? – I braved sticking my head inside. The hide was coated in a dark, greasy substance, like someone had smeared Marmite liberally around the cabin. Matted within the goo was a malodorous collection of black and tan hair. The front door of the house opened and as the vendor approached me, I spotted her hirsute companion: a portly Rottweiler answering to the name of Bernie. I didn’t need to be a trainee forensic scientist making a cameo on Silent Witness to piece together the grime scene. The inside of my Jaguar had previously been Bernie’s home. Not one to renege on a deal, especially one which might have dented my 100% eBay feedback, I handed over the required bundle of twenties, signed the V5 and briskly made my escape. Thankfully, it wasn’t all bad news. The driving position felt typically Jaguar being cosy and comfortable. I was definitely sat securely by virtue of being almost glued to the seat with Bernie’s secreted oils. Mechanically it felt smooth and sounded sweet with no worrying noises or clonks emanating from the engine bay into the leather-lined kennel. Automatic gear changes, accessed via the familiar J-gated lever, were seamless, kicking down without transmission jerk thumping you in the back. The performance of the 3.2 straight six was disappointing though, being no more than slightly above adequate for a large, luxury car. The sheer bulk of its heavy 1980s metalwork blunted rapid progress in a way the 4-litre would have had horses in reserve. How those earlier 2.9s garnered the momentum to move at all remains a mystery to me. The hour and a half journey home was enjoyable, the handling felt wieldy but the rear end was more willing to step out when the throttle was opened than I’d expected. Certainly the mild tyre squeal and shopping trolley decent angles exiting roundabouts felt on the buttock clenching side of sporting. Being a later XJ40 the instrument binnacle was not the space invaders meets Smiths of Derby timepieces dashboard that blighted early models. The analogue dials were backlight in a rather beautiful hue of turquoise, as were the other controls, creating it delightfully eerie glow at night. The drive back to Lincoln also provided an opportunity to test all of the electrical equipment, with relief washing over me with each successful operation of a switch, button or dial. The air conditioning blew chillingly on demand but to counter that win the rear fog lights being permanently on was a definite fail. As I’ve mentioned in other posts and in tweets, my mechanical knowledge and understanding is disappointingly lacking. While I was sure I could work in the minor cosmetic issues, giving the engine a once over was beyond the realms of my capability. The service history was fairly full and wasn’t in need of one and the MOT had the best part of a year to run so I had some confidence. Thankfully, my brother-in-law, a qualified mechanic, gave it a thumbs up when he gave it a once over, allowing me to tweak here and there in the areas I could manage. A brief search of the internet unearthed a Jaguar breaker who offered parts at very reasonable prices. I found the front bumper corner I needed and replacement fog light switch, which was the full extent of that electrical irk. By a fortunate coincidence, a similarly specced Gold edition XJ6 had been broken recently too, allowing me to pick up a near mint set of leather seats for £200. 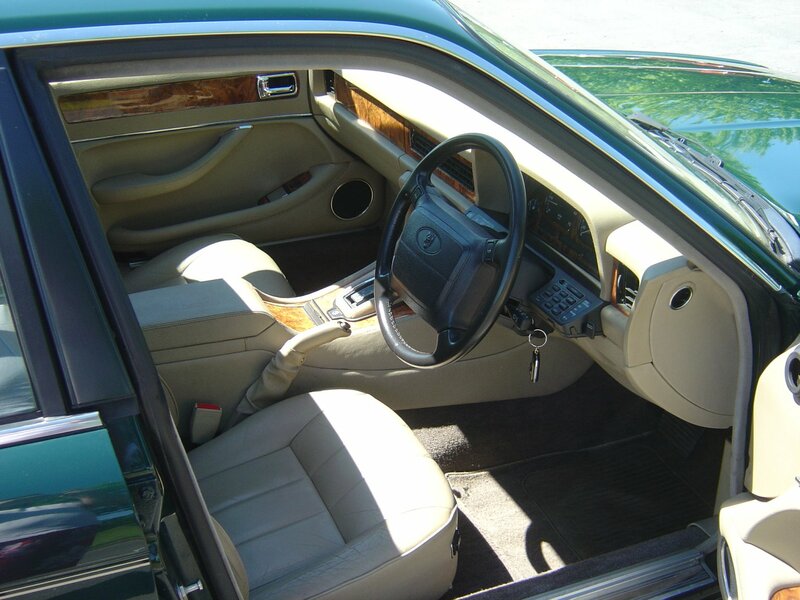 The Gold edition had a different pleating pattern to the regular XJ6s and more luxurious Sovereigns, thus replacing the worn out interior with the correct design was very satisfying. New walnut door cappings to replace delaminating originals completed the order and the following Saturday was spent installing everything. I had some further good fortune when I managed to sell the original, tatty interior for £100, having simply de-scummed it with a hearty main course of Fairy liquid and a dessert of leather food. The following weekend was spent giving it a thorough clean. Not up to professional valeting standards but certainly as good as I could manage with elbow grease and off the shelf cleansers. Although the paintwork was a non-metallic it buffed to a fine glossy finish, the brightwork sparkled and an air conditioning bomb (and a bottle of Febreze) ridded the insides of any lingering canine stench. That left two further purchases before it was ready for sale – a pair of new Pirellis for the back wheels. The exuberance it displayed wagging its tail around corners when taken purposefully was solely due to the tread on the rears looking like British Touring Car slicks. After a race. Waiting a week to buy them is one of those regretful episodes in life. Not wanting to risk being caught out by the police who might spot the tyres I barely drove the car, but one night when going to visit my old man in hospital, I risked it. My XM was on fuel vapours so rather than filling it up, or even walking the two mile journey, I took the Jag. There’s a moral here somewhere about not being tight or bone idle. All was fine until I was about to go home – there was now an inch of slushy snow blanketing the roads and car park. I gingerly made my escape, delicately manoeuvring to the exit at the main road without wheelspinning drama. I’ve long harboured a hope that if ever I was unfortunate enough to spin a car on a public highway, it might make an urban edition of an And They Walked Away DVD if someone filmed it on their mobile. This though, was pathetically and expensively disappointing. A combination of snow, painted white lines, treadless tyres and a dab of throttle sent the rear careering around 270 degrees, stopping rather violently against a kerb with a metallic clonk noise signalling the end of the theatrics. Thinking I’d merely had a moment of embarrassment, I set off home but stopped again almost immediately, the noises and vibrations not being hallmarks of its previous handling characteristics. The right rear alloy wheel had split across its chord and the tyre was flat, the air having escaped in the gap big enough to insert your fingers. Swearing repeatedly to myself, I coaxed it home, barely above the driveline’s creeping speed, hazard lights beaconing my approach. Trying to rationalise the disappointment by reflecting upon it as merely the cost of a new wheel on top of the two rear tyres was a short-lived solution. No Jaguar dealer in the country had such a wheel design in stock and neither did the breaker I’d used for the earlier refurbishment, was the response to frantic phone calls. Before leaving work, I logged into eBay again in the faint hope something might be available. And something was. In fact, what was available was amazingly fortunate, having a sense of being orchestrated by a higher order power: four fully refurbished, correct design alloys, shod in brand new, stickered Pirellis on a £400 Buy It Now. PayPal account emptied, rear seats on the XM tumbled I bolted off down to Billericay straight from work to collect them. They really were as good as promised too and when fitted to the XJ6 the following weekend, it was ready to be sold. Overall the Jaguar cost me £1900 and I sold it for £1750. The money I recouped for the old interior and three slightly scruffy alloys gave me a meagre profit of £50. Mike Brewer would not be impressed… This experience of being an amateur car trader should have put me off, but an MGF later and it still feels like unfinished business. I still see the Jaguar most weeks, as it now resides not far from where I work and despite it being five years on since I sold it, it still looks as good as it does on the pictures and is clearly being enjoyed. I imagine Bernie’s progressed onto a Bentley by now but I avoid looking when the Merlot’s uncorked. This is quite an interesting story you got here. Creating and experiencing things like a amateur car trader must’ve made things very interesting and fun especially when you are so passionate about cars. It sounds like your last minute encounter on eBay really helped out. Sent you an email Annette.